Expert Verified By: Dr. Amanda Seavey, Ph.D.
Getting a good night’s sleep in college can be tough. There’s an old saying: In college, you can have a great social life, get good grades, and get adequate sleep. Oh, but you can only have two of those three things at once! For many students, sleep goes on the back burner. According to the University of Georgia Health Center, college students sleep an average of 6 to 6.9 hours each night. 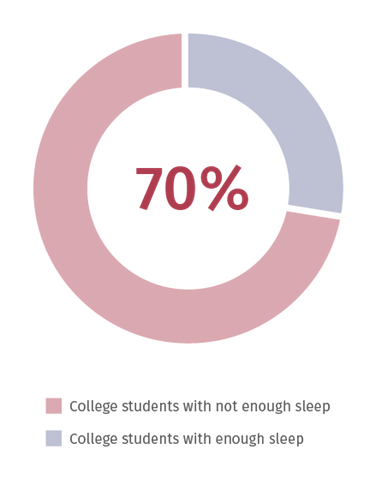 Another study found that around 70 percent of college students aren’t sleeping enough. Research suggests that lack of adequate sleep can affect grades, mood, and even safety while driving. So why aren’t college kids sleeping enough — and how can they fix the issue? Here’s everything you need to know. Research shows that teenagers don’t get enough sleep, and things might get worse instead of better as teens go off to college. Here are some of the many reasons why college students might be deprived of sleep. Many students have roommates or suitemates that affect their sleep. Sharing a bedroom or apartment can lead to scheduling conflicts. Some people will prefer getting up early and going to sleep early, while others are night owls and late risers. 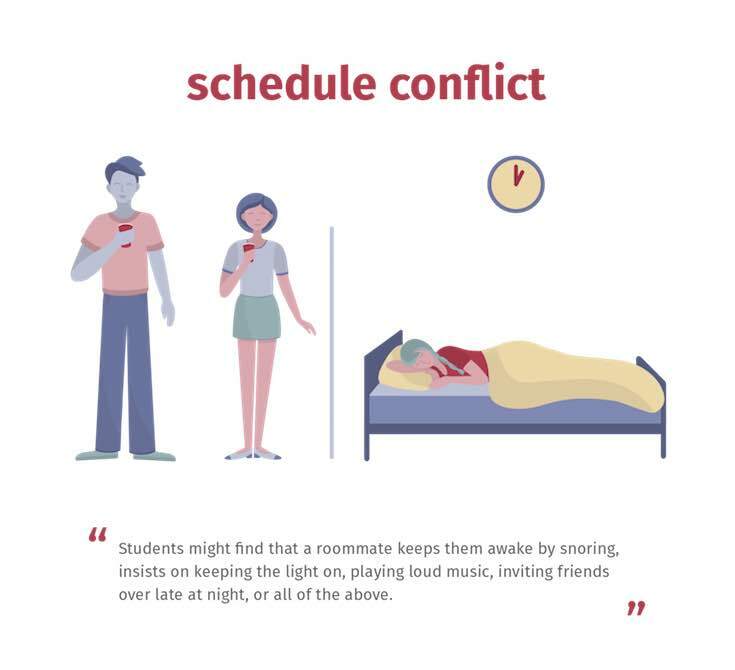 Students might find that a roommate keeps them awake by snoring, keeping the lights on, playing loud music, inviting friends over late at night, or all of the above. Even the most conscientious of roommates can accidentally cause issues if they bunk with a light sleeper who will wake up as soon as they hear their roommate stirring across the room. Plus, many college dorms have bunk beds — meaning your entire bed will shake every time your roommate gets in or out of their own bunk. Bottom line: Living with a roommate(s) is not always conducive to a peaceful sleep environment. Another thing affecting college students’ sleep? Their crazy schedules. 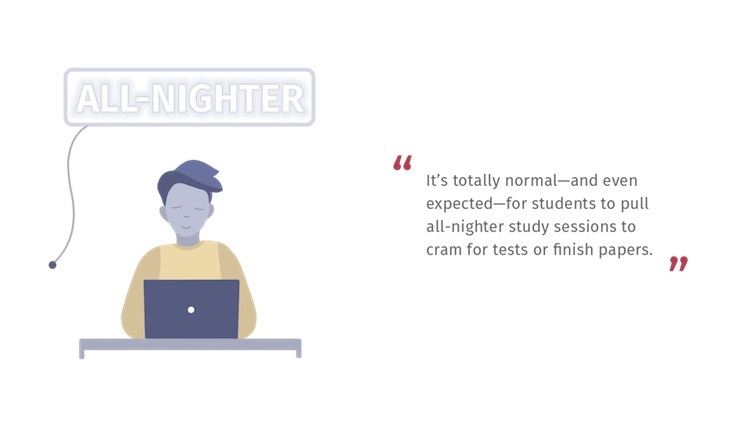 It’s totally normal — and even expected — for students to pull all-nighter study sessions to cram for tests or finish papers. Student athletes may have early morning practice sessions, and students who are involved in theater or arts might rehearse until very late at night. Not to mention classes themselves, which can start in the early morning or late evening. Add the part- or full-time jobs that many students work into the mix, and it’s no wonder sleep is not a priority. And then there’s your typical college social life. For many people, college means late-night parties, going to movies, board game nights, or staying up all night talking about life. 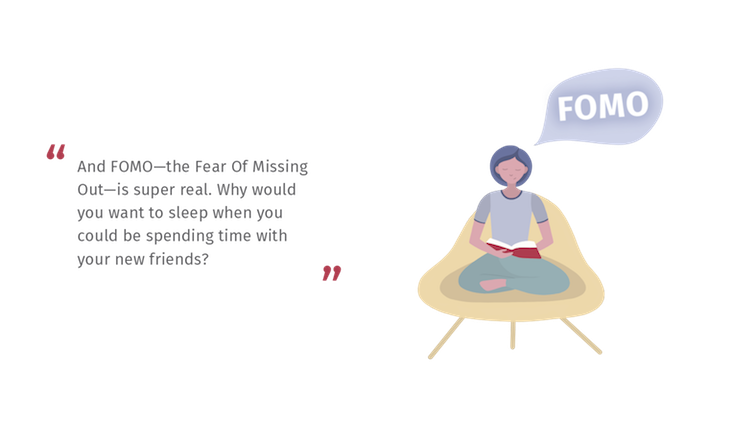 And FOMO — the Fear Of Missing Out — is super real. Why would you want to sleep when you could be spending time with your new friends? Plus, socializing in college is important. It’s a time to make lasting friendships and interact with a new and diverse set of people. Unfortunately, all that socializing can get in the way of a good night’s sleep. College students who drink alcohol may find this affects their sleep. After drinking alcohol, many people will feel tired and fall asleep easily. The National Sleep Foundation actually estimates that 20 percent of people use alcohol as a tool to help them sleep. But even though alcohol helps you fall asleep more quickly, it actually causes poor quality sleep. Per WebMD, alcohol reduces the amount of rapid eye movement (REM) sleep that you get. And research suggests that even one night of binge drinking might impair sleep quality. And of course, there are no parents around to enforce curfews or bedtimes. For kids who have never lived on their own before, there might be a major appeal in staying up late “just because” — especially if they always had an enforced bedtime before heading off to college. A big part of college is learning how to take care of yourself when no one is around to make you do things, and controlling your own daily schedule is a new experience for many students. Even though research suggests college students aren’t getting enough sleep, adequate shut-eye is essential for wellbeing. Here are just some of the reasons why sleep is so important for college students of all ages. Sleep has a major effect on grades. Sleep is important for getting good grades and remembering what you’ve learned. Quality sleep is necessary for athletic performance. Per the National Sleep Foundation (NSF), poor-quality sleep can impair athletic performance in several ways (while adequate sleep can improve it). In contrast, getting plenty of sleep can increase the odds that you’ll feel energized and focused come game time. Sleep is essential for all-around wellbeing. There’s even evidence that sleep improves our day-to-day happiness. Bottom line? Getting enough sleep is critical for navigating the unique demands of life at college. Keeping up with busy schedules, staying on top of coursework, and finding the energy to make new friends are all easier when you feel well-rested and energized. We know that adequate sleep is essential for college students, but how is “adequate” defined? 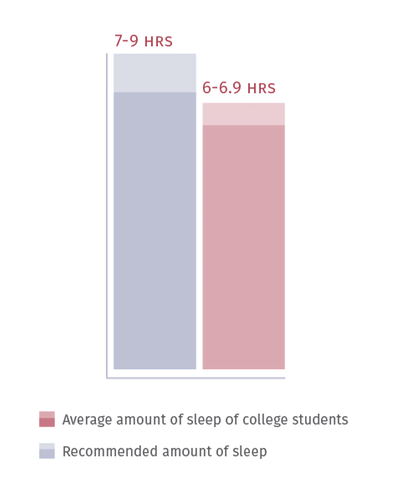 How much sleep does a college student actually need? The National Sleep Foundation recommends that young adults aged 18 to 25 sleep for seven to nine hours each night. Everyone is different, and some people will find that they perform best at one or the other side of the spectrum. For example, some people may feel well-rested after seven hours of sleep, while others need 8.5 or nine hours to feel rejuvenated and ready to take on the day. Individuals should experiment with different sleep-wake times to identify the number of hours that is most likely to have them feeling their best. Here’s one thing that’s true for everyone: Pulling an all-nighter is really not a great idea. Sometimes it seems like staying up all night is the only way to get your work done on time or to study enough for an upcoming test. Some students rely on all-nighters only in dire circumstances; others are in the habit of burning the midnight oil on a regular basis. In order to stay up all night without drifting off, students might drink coffee or energy drinks or pop caffeine pills that are pretty bad for you. These substances might provide a quick fix, but they can also enable pushing your body beyond what’s healthy. What’s more, consuming too much caffeine can have some seriously unpleasant side effects. One night without sleep can affect your sleep schedule and energy levels for a number of days afterward. “Stay awake longer than 18 consecutive hours, and your reaction speed, short-term and long-term memory, ability to focus, decision-making capacity, math processing, cognitive speed, and spatial orientation all start to suffer,” a Harvard Business Review article explains. Want to make the most of your brainpower and study efficiently rather than cramming? Most experts agree that the healthiest and most effect way to prep for a test or presentation is to work over a number of days, during the daytime, in short chunks of 20 to 30 minutes. This requires some time management skills, but it contributes to long-term success. From noisy roommates to all-nighters: No matter the causes of a college student’s sleep deprivation, not sleeping enough can come with some nasty side effects. Here are some of the primary consequences of sleep deprivation at college. Sleep deprivation and irregular sleep schedules can affect your grades. For a small study published in the journal Scientific Reports, researchers followed 61 students for 30 days (1). They concluded that students with irregular sleep schedules were more likely to have lower grades. The researchers say this study emphasizes how important sleep is for students. There’s plenty of evidence to back up this theory. Studies suggest that sleep deprivation affects your attention span, working memory, and long-term memory, all of which play a role in schoolwork (2). Not sleeping enough? Your mood will suffer. 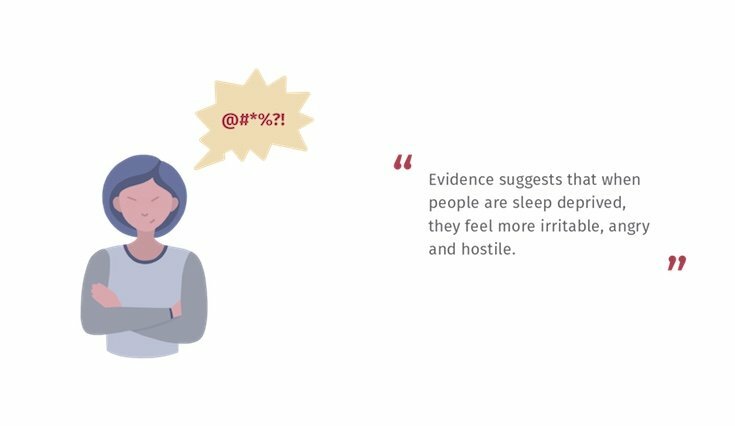 According to the Division of Sleep Medicine at Harvard Medical School, a sleepless night can leave you feeling irritable, easily stressed, and in a foul temper. And of course, there are physical consequences too. Sleep deprivation could affect your immune system, making you more susceptible to common colds or the flu. “It is an old wives’ tale that if you don’t sleep well, you will get sick, and there is some experimental data that shows this is true,” sleep doctor Diwakar Balachandran told WebMD. There are obvious signs that you are tired, such as feeling sleepy, yawning, and struggling to keep your eyes open. But you might be more tired than you actually think, especially if you are chronically sleep-deprived. You might feel irritable, unmotivated, or anxious. You could have trouble concentrating and have delayed reaction times. You might make poor decisions. You’re more likely to make errors on schoolwork. You could find yourself forgetting things. What’s more, sleep deprivation is associated with an increased risk of high blood pressure (also known as hypertension), obesity, diabetes, and heart attacks. In theory, addressing sleep deprivation is simple: Just find a way to sleep more. In practice, it can be hard to overhaul your sleep habits so that you get enough rest. Here are some ways to ease into new habits and sleep better on a college campus. If your schedule is too crazy: Free up more time for yourself. Obviously, you don’t want to miss out on fun social activities or skip any important rehearsals, practices, or other commitments. But if you find yourself completely overwhelmed with responsibilities, take a look at everything on your plate and see if there is anything you can scale back on, combine, delegate, or reschedule. If your roommates are causing your sleep issues: Propose a compromise. Maybe one roommate has a loud alarm clock that wakes you up every morning; perhaps they could switch to a vibrating alarm on their phone or smartwatch. If your roommate goes to bed much later than you, maybe they can agree to use a flashlight once you’ve gone to sleep and to be as quiet as possible when they get ready for bed. If social visits are causing the issues, draft a roommate agreement that mandates no guests after a certain time of night. If there’s too much noise in your room, suite, or hallway: Get some gear. See if earplugs and an eye mask can help. Listen to white noise from a fan, app, or white noise machine. Talk to students who are being seriously disruptive (such as by playing loud music or shouting at night) and ask them if they could keep it down or take their hangouts to another space. If you don’t feel comfortable talking to other students or if talking to them hasn’t improved the situation, ask your dorm’s resident adviser for advice on how to handle things. If you are in a rental apartment, talk to your landlord to see what they recommend. If you’re pulling all-nighters: Take a hard look at your study habits. As noted above, pulling an all-nighter is not an efficient or effective study tool. Here’s what you should do instead. Your college may have resources to help you overhaul your study habits and stay on top of schoolwork. If you are struggling, reach out to someone who might be able to help. 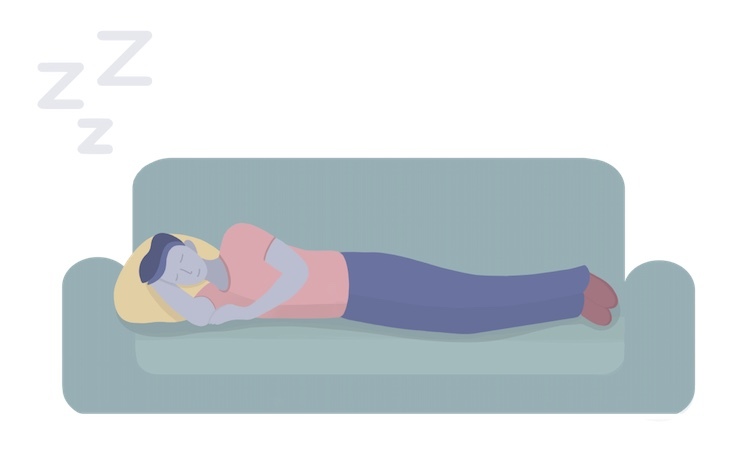 If bad sleep hygiene is interfering with your sleep: Adopt some good habits. Are you finding it hard to fall asleep at night? Consider whether you have good sleep hygiene habits. For example, do you work or watch movies in your bed? Do you go straight from studying or partying to sleep, without any time to wind down? Do you consume caffeine or spicy food late at night? Even small lifestyle changes can make a difference in your sleep quality. For example, you might commit to only studying at your desk (rather than in your bed) or take 10 minutes to meditate or write in a journal before you go to sleep. If possible, try to stick to a regular sleep schedule by going to bed and waking up at roughly the same time every day — even on weekends. Can Napping Help Solve College Students’ Sleep Woes? A nap can help boost your energy in a pinch, but don’t overdo it. Napping can be really useful for students by helping them get a boost of energy when they need it. But the way you nap can have a big impact on whether the nap will energize you or leave you feeling even more tired than before you dozed off. Here are some tips for more effective napping. The University of Michigan Health website notes that napping in the late afternoon or evening may make it harder to fall and stay asleep come nighttime. Indeed, research suggests that college students who napped in the late afternoon or evening had worse sleep at night. It may also be helpful to nap immediately after a study session. Some research suggests napping can help you remember information, so a quick nap after studying might increase your chances of retaining what you’ve studied. While napping may carry some benefits, it’s important to note that napping to much is likely to have negative impacts on sleep. If you’ve tried the tips above and you’re still feeling sleep deprived on a regular basis, it’s time to talk to an expert. If you have access to a student health center, drop in to discuss your sleep issues. You might need to see a doctor to get checked out for sleep disorders, which are very common and nothing to feel ashamed about. Per the Cleveland Clinic, there are around 80 different sleep disorders, and they affect over 70 million Americans. Insomnia. As you are probably aware, insomnia is characterized by struggling to fall or stay asleep, which can lead to acute or chronic sleep deprivation. Chronic insomnia is linked to anxiety, depression, and stress. A polysomnography, which involves a sleep study during which you sleep hooked up to a few different monitors and machines. These machines gather data about your brain waves, oxygen levels, and heart rate during sleep. This information can help your doctor figure out if certain sleep stages are being disrupted and identify what’s causing that disruption. A sleep electroencephalogram, which is a test that monitors the electrical activity in your brain. Usually an electroencephalogram is performed during a polysomnography test, but some people may need just the electroencephalogram without the other monitoring. Once your doctor has determined a diagnosis, they will work with you to find a suitable treatment option. This could include medication, a positive airway pressure (PAP) machine, specific lifestyle changes, or mental health treatment. Ultimately, it’s really important to sleep well in college. And you can do it without sacrificing grades or your social life. College students may find a number of obstacles to getting good sleep, including noisy roommates, an overbooked schedule, or stress about schoolwork. But it’s essential to get enough sleep in college in order to maximize your academic potential, maintain your active schedule, and make and sustain new friendships — not to mention staying physically healthy. Luckily, there are lots of things students can do to enjoy better sleep. These include committing to regular bedtimes and wake-up times, minimizing dorm room noise, prioritizing sleep hygiene, and getting your health checked out if all else fails. It takes a bit of planning and dedication, but sleeping enough in college can be done! Phillips, A.J.K. et al. “Irregular sleep/wake patterns are associated with poorer academic performance and delayed circadian and sleep/wake timing.” Scientific Reports. 2017 Vol 7; 3216. Alhola, P. and Polo-Kantola, P. “Sleep deprivation: Impact on cognitive performance.” Neuropsychiatric Disease and Treatment. 2007 Oct; 3(5): 553–567.